Blakeney Hotel is a family owned hotel enjoying a magnificent quayside location with panoramic views across the Estuary and salt marshes to Blakeney Point, a designated Area of Outstanding Natural Beauty. The hotel has over 60 bedrooms, 2 luxurious lounges, a recently refurbished bar and restaurant, as well as billiard and games rooms, indoor swimming pool, spa bath, steam and sauna room and mini gym. The swimming pool looks over a sun terrace and secluded south facing gardens. 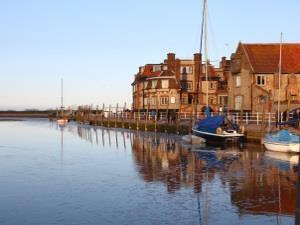 Blakeney Hotel also has terrace overlooking the Estuary where drinks and snacks are served. The hotel has extensive conference and banqueting facilities for up to 100 people and we have our own car park. Take the A1065 to Brandon to Swaffham to Fakenham. At the Fakenham roundabout go straight on to the A148 for about 9 miles and take left turn on to the B1156 signposted to Langham and Blakeney for about 5 miles to the edge of Langham turn right, go two miles to the Blakeney cross roads and go straight on to the Quayside and the hotel.